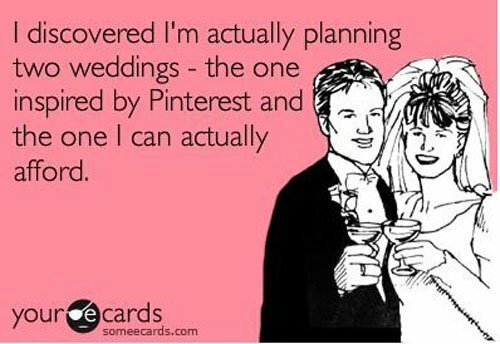 Plan a wedding, they said. It’ll be fun, they said. 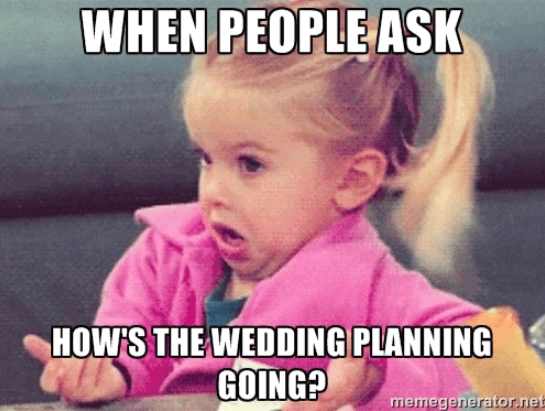 Whether you’re a bride-to-be or forever a bridesmaid, you know that wedding planning can be fun, crazy, stressful, exhausting, exhilarating, and infuriating – all at the same time. But don’t let it get to you. 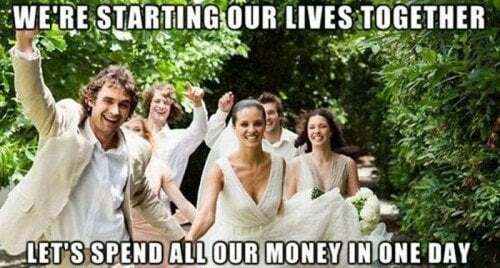 These funny wedding memes are #relatable and can totally help you laugh your way to your big day. 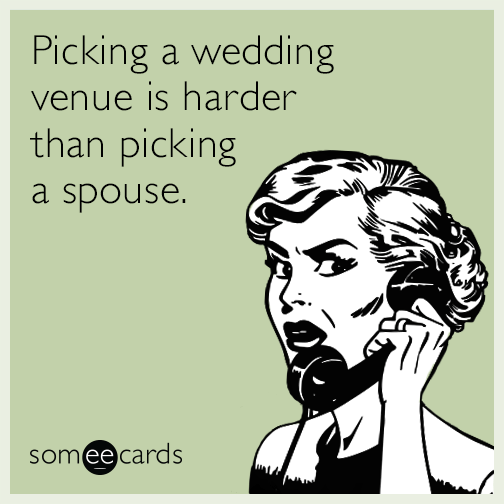 Hot tip – weddings don’t plan themselves. 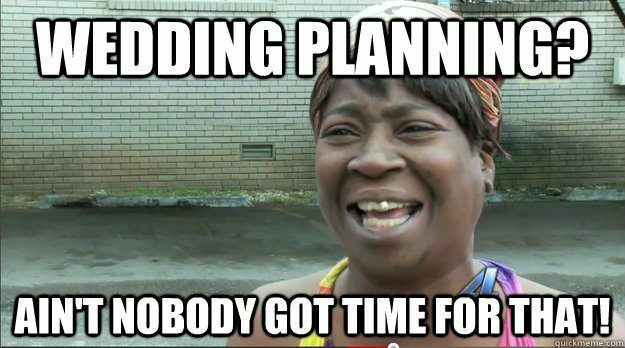 And if you wait until the last minute to plan your wedding, it’s gonna look like you waited until the last minute. Brides, you might only be concerned about your floral arrangements and if your bridesmaids can get along, but don’t forget about your guests. There’s nothing worse than a wedding with terrible food or even worse, not enough food. Remember – a divorce attorney is less expensive than a defense attorney. If he does not commit, you must…quit. Trust us on this – you can’t make a man want to get married. 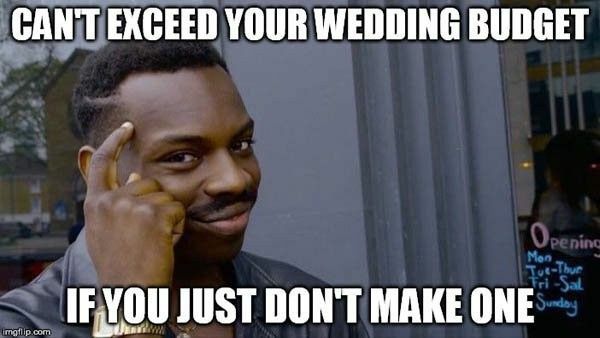 At least if you want to stay married. Life is long. And hopefully your marriage will be, too. But please wait to go down the aisle until you’re ready. Or at the very minimum, old enough to drink. Isn’t it amazing how random people in your life suddenly become wedding experts once you get engaged. I mean, who knew single Aunt Doris was such an expert on floral arrangements? Little did Priscilla know, but her groom to be had a terrible addition to catnip and laser pointers. 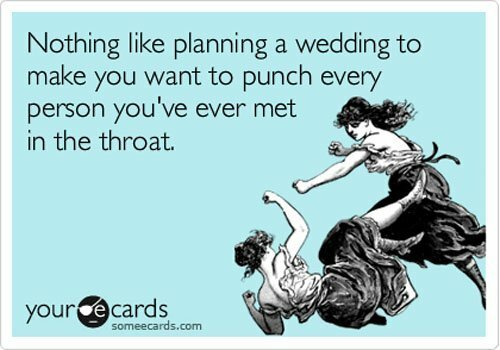 If you have to ask if you’re invited to my wedding, please just assume you aren’t, mmmkay? A tropical vacation is nice and all, but not when it’s interrupted by someone’s wedding. See also: weddings held on holidays. 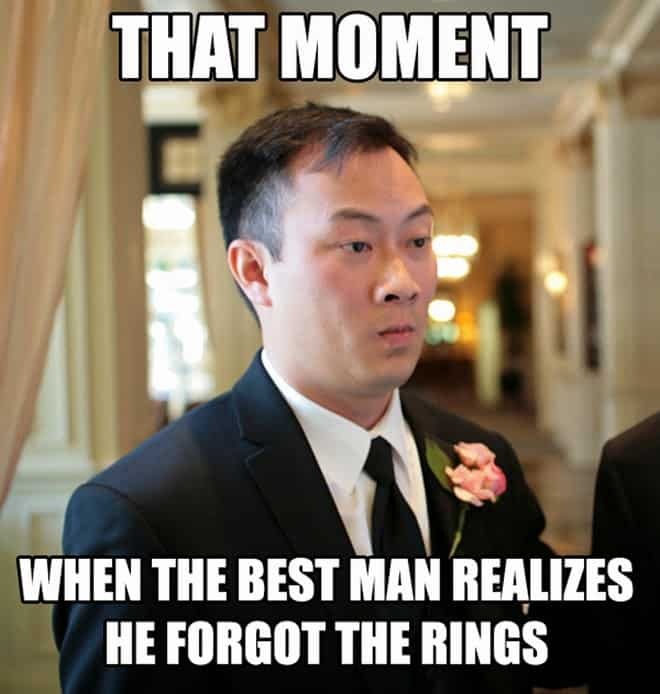 It’s understandable when a little ring bearer forgets the rings. But a grown man? C’mon, buddy! Get it together. What you don’t know, gooms, won’t hurt you. Just show up on time in your tux and everything will be just fine. Have you ever been to a wedding with a cash bar? 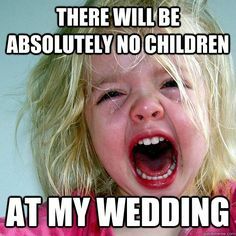 Or a dry wedding? If you don’t spring for an open bar, you might as well fire your DJ because no one besides your great aunt Ethel and your creepy cousin Phil are brave enough to get on the dance floor without some liquid courage. I know you want to have a nice wedding and all, but…maybe let your honey spend a little bit of money on non-wedding related things. Our suggestion? Maybe don’t do that. Getting married must be the best thing ever, because everyone seems to want you to do it. 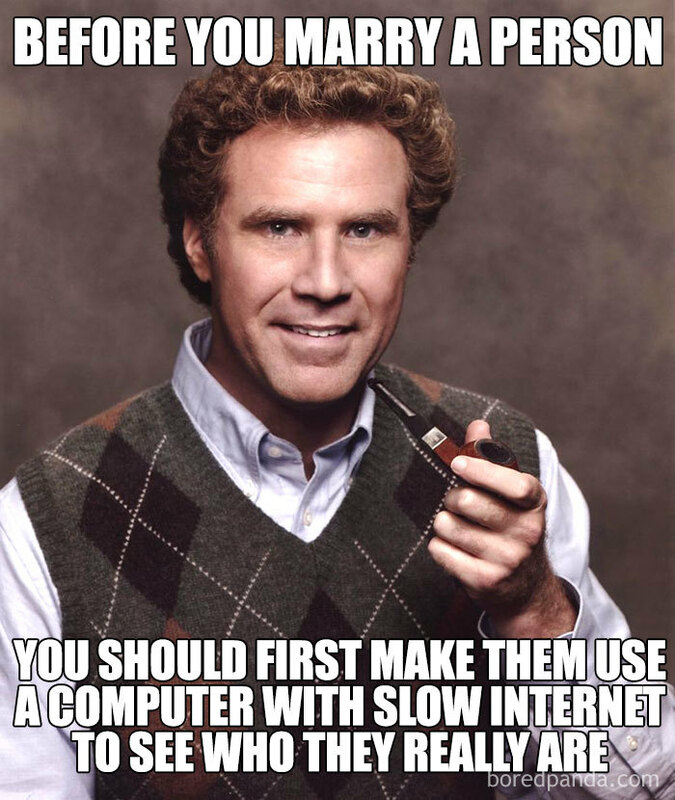 I mean…this is some solid logic. They might turn into an angry dragon when a page doesn’t load. Understandably. You should be more concerned if they’re not upset. You mean I can’t have handmade rustic chic plus all designer everything in an exotic locale on my budget? Baloney! Aren’t you just tempted to say, “no,” sometimes to see how people react? Ain’t that the truth? And if you have kids, a job, or out of town relatives, you might as well just throw in the towel and elope. I mean, why would you want air-conditioning on a 90 degree day in August? 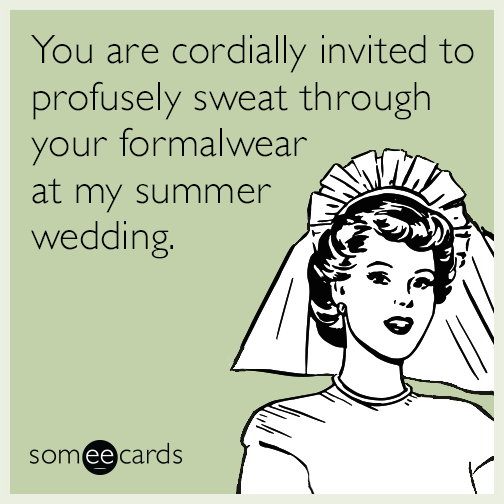 Wouldn’t you rather enjoy the sweaty beauty of an outdoor wedding? 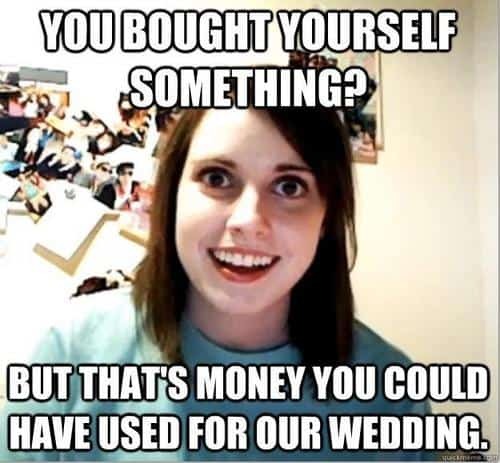 Most likely, your fiance’ isn’t going to care about the small details. 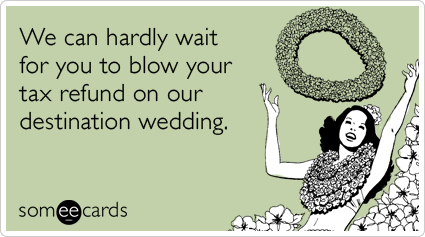 Our apologies if you’re marrying a groomzilla. 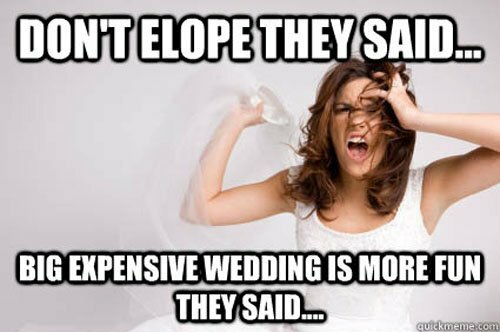 If you don’t ask yourself at least a dozen times, “why didn’t I just elope,” did you even plan a real wedding? But we bet someone will bring one anyway. Trust us on this. Keep some extra crayons on hand and have the caterers ready to whip up a kids meal. Q: When is it appropriate to wear white to a wedding? 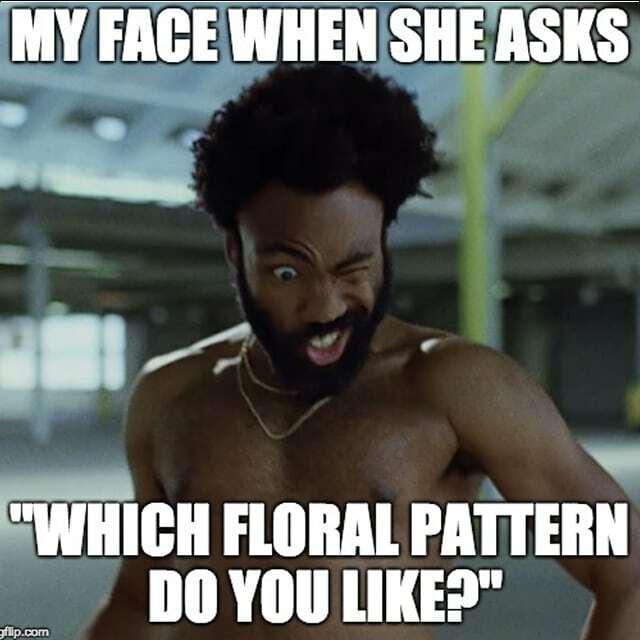 A: Only when you’re the bride. Zero exceptions. Who knew that this would be one of the hardest decisions? Seating charts are made for a reason. No one wants to play musical chairs at a wedding. 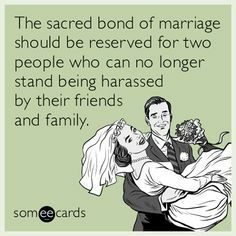 And no one wants to get seated next to their ex, so stay put. Enjoy it while it lasts, kids. The bank of mom and dad is about to close. Let’s face it, if you’ve found someone who can put up with your kind of crazy, hang on tight and don’t let go. 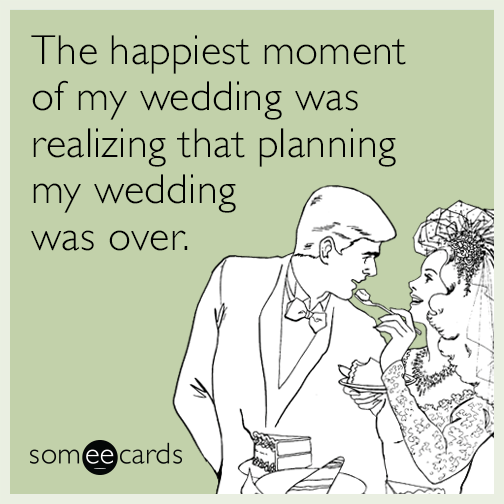 And unless you’re renewing your vows, hopefully you don’t have to plan one ever again.